The Red Beds of Texas and Oklahoma are a group of Early Permian-age geologic strata in the southwestern United States outcropping in north-central Texas and south-central Oklahoma. They comprise several stratigraphic groups including the Clear Fork Group, the Wichita Group, and the Pease River Group. The Red Beds were first explored by American paleontologist Edward Drinker Cope starting in 1877. Fossil remains of many Permian tetrapods (four-limbed vertebrates) have been found in the Red Beds, including those of Dimetrodon, Edaphosaurus, Seymouria, Platyhystrix and Eryops. A recurring feature in many of these animals is the sail structure on their back. Deposits dating from the Permian are present contiguously stretching from central Texas all the way into southern Nebraska. In Nebraska and Kansas, deposits of light-colored limestone are frequent, while red-colored rocks are rare. In Oklahoma, the light-colored limestone transitions gradually into red-colored sandstone and shale until the limestone is virtually nonexistent in north-central Texas. The portion of the red beds with abundant fossil deposits is in Texas between the Red River and the Salt Fork Brazos River. The area includes the city of Wichita Falls, as well as rural communities such as Seymour and Archer City. The Texas and Oklahoma red beds are sedimentary rocks, mostly consisting of sandstone and red mudstone. The red color of the rocks is due to the presence of ferric oxide. The rocks were deposited during the early Permian in a warm, moist climate, with seasonal periods of dry conditions. The Texas and Oklahoma red beds can be split into three primary stratigraphic groups: the Wichita Group, the Clear Fork Group, and the Pease River Group. The Wichita Group is the oldest of the three groups, having been deposited in the Sakmarian age. The Wichita Group contains some of the richest fossil deposits in the red beds, including the Geraldine Bonebed in Archer County. The Pease River Group is the most recent deposition, occurring during the Guadalupian epoch. The Clear Fork Group is in between the other two, being deposited during the Kungurian age. The stratigraphic groups are layered such that the Pease River Group overlies the Clear Fork Group, which overlies the Wichita group. In 1877, Edward Drinker Cope was the first paleontologist to study the red beds in search of fossils. Cope employed collectors to aid him in his search for bones, including the Swiss botanist Jacob Boll. After Boll's death in 1880 while collecting, Cope employed a preacher named W.F. Cummins to continue the search. 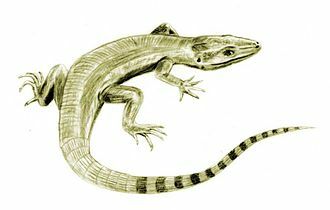 After Cope, paleontologists such as Ermine Cowles Case and Alfred Romer found rich deposits of Permian-era tetrapods. Edaphosaurus boanerges fossil skeleton from Archer County, on display in Harvard Museum of Natural History . The most prolific fossil site in the red beds is the Geraldine Bonebed within the Wichita Group. During the Permian, the bonebed was the site of a freshwater pond, which after a catastrophic event became the burial site for a variety of terrestrial and marine animals. As a result, the bonebed contains a cross-section of life during the early Permian. Plant remains found in the bonebed include Calamites, ferns, and conifers. Marine life present in the bonebed include Xenacanthus, ostracods, and lungfish. The Geraldine Bonebed is most famous as a prolific source of temnospondyls, synapsids, basal reptiliomorphs and reptiles, including partial and complete skeletons of Archeria, Eryops, Edaphosaurus, Dimetrodon, Bolosaurus, Trimerorhachis, Zatrachys, and Ophiacodon. The Clear Fork Group also contains multiple fossil sites. Like the Geraldine Bonebed and other Wichita Group sites, The Clear Fork Group is most famous for its early Permian amphibian deposits, especially Seymouria baylorensis. 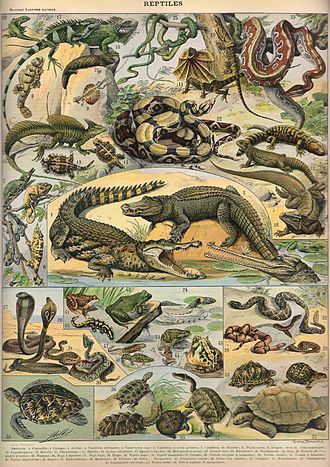 The species and genus were first discovered in 1904 by the German paleontologist Ferdinand Broili. Seymouria baylorensis is named for the location of its discovery in Baylor County near the city of Seymour. As one of the few Seymouria bone sites in the world, paleontologists have studied the Clear Fork deposit for evidence of Seymouria as a transitional fossil between aquatic and terrestrial animals, as well as Seymouria's close relationship to amniotes. The Clear Fork Group also contains deposits of plant species throughout different sections of the Clear Fork Group. The increasing prevalence of seed plants with pockets of water-based plants can be used to infer a wet, but drying climate. ^ a b c Nelson, John W., Robert W. Hook, and Dan S. Chaney (2013). Lithostratigraphy of the Lower Permian (Leonardian) Clear Fork Formation of North-Central Texas from The Carboniferous-Permian Transition: Bulletin 60, ed. Spencer G. Lucas et al. New Mexico Museum of Natural History and Science, pg. 286-311. Retrieved December 28, 2017. ^ a b Cope, E.D. (1878). Descriptions of Batrachia and Reptilia from the Permian Formation of Texas. Proceedings of the American Philosophical Society, vol. 17, no. 101, pg. 505-30. Retrieved December 28, 2017. ^ Dougal, Dixon (2014). The Complete Illustrated Encyclopedia of Dinosaurs & Prehistoric Creatures. Hermes House. p. 76. ISBN 9781846812095. ^ King, Philip B., and Helen M. Beikman (1976). The Paleozoic and Mesozoic Rocks; A Discussion to Accompany the Geologic Map of the United States. United States Geological Survey, Professional Paper 903, pg. 29-32. Retrieved December 29, 2017. ^ Case, E.C. (1915). Chapter 1: Description of the Southern Portion of the Plains Province in The Permo-Carboniferous Red Beds of North America and Their Vertebrate Fauna. Carnegie Institute of Washington, pg. 5-61. Retrieved December 29, 2017. ^ a b c d e Benton, Michael (2001). Chapter Three: Four Feet on the Ground from The Book Of Life: An Illustrated History of the Evolution of Life on Earth, ed. Stephen Jay Gould. W.W. Norton: pg. 93-5. Retrieved December 28, 2017. ^ Barnes, V.E., et al. (1987). Geologic atlas of Texas, Wichita Falls-Lawton sheet. University of Texas at Austin Bureau of Economic Geology. Retrieved December 28, 2017. ^ Sander, P. Martin (1989). Early Permian depositional environments and pond bonebeds in central Archer County, Texas. Palaeogeography, Palaeoclimatology, Palaeoecology, vol. 69, pg. 1-21. Retrieved December 28, 2017. ^ Van Houten, Franklin (1973). Origin of Red Beds: A review - 1961-1972. Annual Review of Earth and Planetary Sciences, Vol. 1, pg. 39-61. Retrieved December 28, 2017. ^ Baker, Charles Laurence (1916). 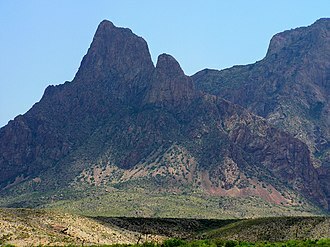 Origin of Texas Red Beds. Bulletin of the University of Texas, No. 26. Retrieved December 28, 2017. ^ a b Chaney, D.S., and W.A. DiMichele (2007). Paleobotany of the classic redbeds of north central Texas. Proceedings of the XVth International Congress on Carboniferous and Permian Stratigraphy, pg. 357-66. The Netherlands: Utrecht. Retrieved December 29, 2017. ^ a b c d e Johnson, Garyd (2013). Xenacanth Sharks and other Vertebrates from the Geraldine Bonebed, Lower Permian of Texas from The Carboniferous-Permian Transition: Bulletin 60, ed. Spencer G. Lucas et al. New Mexico Museum of Natural History and Science, pg. 161-7. Retrieved December 28, 2017. ^ Case, E.C. (1914). The Red Beds between Wichita Falls, Texas, and Las Vegas, New Mexico, in Relation to their Vertebrate Fauna. The Journal of Geology, vol. 22, no. 3, pg. 243-59. Retrieved December 28, 2017. ^ Romer, Alfred, and Llewellyn Price (1940). Review of the Pelycosauria. Geological Society of America, Vol. 28, Special Paper. Retrieved December 28, 2017. ^ Sander, P. Martin (1987). Taphonomy of the Lower Permian Geraldine Bonebed in Archer County, Texas. Palaeogeography, Palaeoclimatology, Palaeoecology, Volume 61, pg. 221-36. Retrieved December 28, 2017. ^ Williston, S.W. (1911). Restoration of Seymouria baylorensis Broili, an American Cotylosaur. The Journal of Geology, vol. 19, no. 3, pg. 232–7. Retrieved December 29, 2017. ^ Laurin, Michel (1996) A redescription of the cranial anatomy of Seymouria baylorensis, the best known seymouriamorph. Paleobios, Vol. 17, no. 1, pg. 1-16. Retrieved December 29, 2017. ^ Carrol, Robert L., and Robert B. Holmes (2008). Evolution of the Appendicular Skeleton of Amphibians from Fins into Limbs: Evolution, Development, and Transformation, ed. Brian K. Hall. University of Chicago Press, pg. 206-9. Stratigraphy is a branch of geology which studies rock layers and layering. It is primarily used in the study of sedimentary and layered volcanic rocks, stratigraphy has two related subfields, lithologic stratigraphy or lithostratigraphy, and biologic stratigraphy or biostratigraphy. The first practical application of stratigraphy was by William Smith in the 1790s. 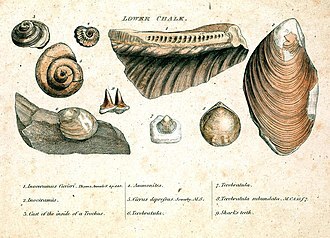 Another influential application of stratigraphy in the early 19th century was a study by Georges Cuvier, variation in rock units, most obviously displayed as visible layering, is due to physical contrasts in rock type. This variation can occur vertically as layering, or laterally, and these variations provide a lithostratigraphy or lithologic stratigraphy of the rock unit. Key concepts in stratigraphy involve understanding how certain geometric relationships between rock layers arise and what these geometries imply about their original depositional environment. The basic concept in stratigraphy, called the law of superposition, states, in a stratigraphic sequence. Chemostratigraphy studies the changes in the proportions of trace elements and isotopes within. Carbon and oxygen isotope ratios vary with time, and researchers can use those to map subtle changes that occurred in the paleoenvironment and this has led to the specialized field of isotopic stratigraphy. Biostratigraphy or paleontologic stratigraphy is based on evidence in the rock layers. Strata from widespread locations containing the fossil fauna and flora are said to be correlatable in time. Biologic stratigraphy was based on William Smiths principle of succession, which predated. It provides strong evidence for the formation and extinction of species, the geologic time scale was developed during the 19th century, based on the evidence of biologic stratigraphy and faunal succession. One important development is the Vail curve, which attempts to define a global historical sea-level curve according to inferences from worldwide stratigraphic patterns, stratigraphy is commonly used to delineate the nature and extent of hydrocarbon-bearing reservoir rocks and traps of petroleum geology. Seymour is a city in and the county seat of Baylor County, United States. 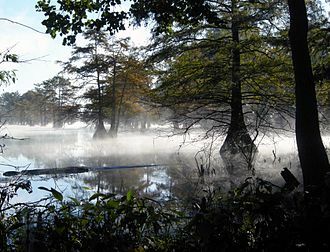 The population was 2,740 as of the 2010 Census, Seymour is located at 33°35′30″N 99°15′39″W, on the Brazos River. It is 52 miles southwest of Wichita Falls and 102 miles north-northeast of Abilene, according to the United States Census Bureau, the city has a total area of 2.9 square miles, of which 0.004 square miles, or 0. 20%, is water. 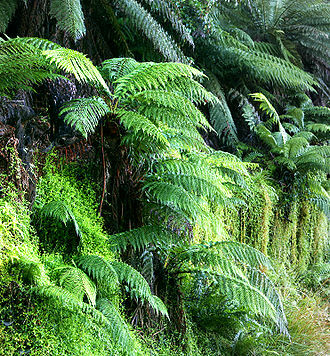 The climate in this area is characterized by hot, humid summers, according to the Köppen Climate Classification system, Seymour has a humid subtropical climate, abbreviated Cfa on climate maps. As of the census of 2010, there were 2,740 people, there were 1,451 housing units,249 of which were vacant. As of the census of 2000, there were 2,908 people,1,273 households, the population density was 1,067.5 people per square mile. There were 1,534 housing units at a density of 563.1 per square mile. 35. 7% of all households were made up of individuals and 21. 9% had someone living alone who was 65 years of age or older, the average household size was 2.25 and the average family size was 2.90. In the city, the population was out with 24. 3% under the age of 18,6. 1% from 18 to 24,20. 9% from 25 to 44,23. 9% from 45 to 64. The median age was 44 years, for every 100 females there were 83.2 males. For every 100 females age 18 and over, there were 79.6 males, the median income for a household in the city was $23,662, and the median income for a family was $32,917. Males had an income of $21,891 versus $19,292 for females. The per capita income for the city was $16,062, about 15. 6% of families and 19. 5% of the population were below the poverty line, including 31. 8% of those under age 18 and 10. 7% of those age 65 or over. Seymour was founded by settlers from Oregon, who called the town Oregon City, it was located where the Western Trail crossed the Brazos River. A post office was established in 1879, at time the towns name was changed to honor local cowboy Seymour Munday. Commerce, a newspaper, a hotel, and the county courthouse all followed soon after, as did violence between cowboys and settlers. Dimetrodon is an extinct genus of synapsid that lived during the Cisuralian Permian, around 295–272 million years ago. It is a member of the family Sphenacodontidae, the most prominent feature of Dimetrodon is the large neural spine sail on its back formed by elongated spines extending from the vertebrae. It walked on four legs and had a tall, curved skull with teeth of different sizes set along the jaws. 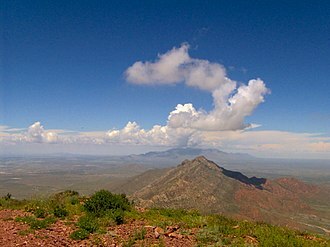 Most fossils have found in the southwestern United States, the majority coming from a geological deposit called the Red Beds of Texas. More recently, fossils have found in Germany. Over a dozen species have been named since the genus was first described in 1878, Dimetrodon is often mistaken for a dinosaur or as a contemporary of dinosaurs in popular culture, but it became extinct some 40 million years before the first appearance of dinosaurs. Reptile-like in appearance and physiology, Dimetrodon is nevertheless more closely related to mammals than to modern reptiles, Dimetrodon is assigned to the stem-mammals or non-mammalian synapsids, a group traditionally called mammal-like reptiles. This groups Dimetrodon together with mammals in a clade called Synapsida, while placing dinosaurs and birds in a separate clade, Sauropsida. Single openings in the skull behind each eye, known as temporal fenestrae, Dimetrodon was probably one of the apex predators of the Cisuralian ecosystems, feeding on fish and tetrapods, including reptiles and amphibians. Smaller Dimetrodon species may have had different ecological roles, the sail of Dimetrodon may have been used to stabilize its spine or to heat and cool its body as a form of thermoregulation. Some recent studies argue that the sail would have been ineffective at removing heat from the body, Dimetrodon was a quadrupedal, sail-backed synapsid. Most Dimetrodon species ranged in length from 1.7 to 4.6 metres and are estimated to have weighed between 28 and 250 kilograms. The largest known species of Dimetrodon is D. angelensis at 4.6 metres, although some Dimetrodon species could grow very large, many juvenile specimens are known. Features such as ridges on the inside of the nasal cavity, the skull of Dimetrodon is tall and compressed laterally, or side-to-side. Calamites is a genus of extinct arborescent horsetails to which the modern horsetails are closely related. Unlike their herbaceous modern cousins, these plants were medium-sized trees and they were components of the understories of coal swamps of the Carboniferous Period. A number of taxa have been identified as part of a united organism. Calamites correctly refers only to casts of the stem of Carboniferous/Permian sphenophytes, there are two forms of casts, which can give mistaken impressions of the organisms. The most common is an internal cast of the void in the centre of the trunk. Further, the fossil gets narrower as it attaches to a rhizoid, because the fossil is a cast, the narrowing in fact represents a constriction of the cavity, into which vascular tubes encroach as they widen. Further organ genera belonging to sphenophytes include, Arthropitys Astromyelon Annularia, the trunks of Calamites had a distinctive segmented, bamboo-like appearance and vertical ribbing. The branches and cones were all borne in whorls, the leaves were needle-shaped, with up to 25 per whorl. Their trunks produced secondary xylem, meaning they were made of wood, the vascular cambium of Calamites was unifacial, producing secondary xylem towards the stem center, but not secondary phloem. The stems of modern horsetails are typically hollow or contain numerous elongated air-filled sacs, Calamites was similar in that its trunk and stems were hollow, like wooden tubes. When these trunks buckled and broke, they could fill with sediment and this is the reason pith casts of the inside of Calamites stems are so common as fossils. Calamites reproduced by means of spores, which were produced in small sacs organized into cones and they are known to have possessed massive underground rhizomes, which allowed for the production of clones of one tree. This is the group of trees of their period known to have a clonal habit. This type of reproduction would allow them to spread quickly into new territory. The rhizomes of Calamites look quite similar to the stems in most cases, Calamites come in a variety of different form genera. The Harvard Museum of Natural History is a natural history museum on the grounds of Harvard University in Cambridge, Massachusetts. The museum is connected to the Peabody Museum of Archaeology and Ethnology. With more than 210,000 visitors in 2013, the Harvard Museum of Natural History is the University’s most-visited museum. The Harvard Museum of Natural History is one of four public museums which are part of a new consortium created in 2012, the mineralogical galleries present a systematic display of meteorites and gemstones. In addition, a series of changing exhibitions bring focus to new research at the University, current exhibitions include Thoreaus Maine Woods, A Journey in Photographs with Scot Miller, Shelled Masters of the Marine Realm, and New England Forests in the Zofnass Family Gallery. The Museum’s educational programs provides a hands-on, observation-based approach, public lectures are another of the Museum’s activities. A travel program complements the museum’s mission to enhance awareness of the natural world, travelling in small groups often led by Harvard science faculty, Museum travellers experience destinations that are of particular importance as recognized hotspots of biodiversity. Sedimentary rocks are types of rock that are formed by the deposition and subsequent cementation of that material at the Earths surface and within bodies of water. Sedimentation is the name for processes that cause mineral and/or organic particles to settle in place. The particles that form a rock by accumulating are called sediment. Sedimentation may occur as minerals precipitate from solution or shells of aquatic creatures settle out of suspension. The sedimentary rock cover of the continents of the Earths crust is extensive, sedimentary rocks are only a thin veneer over a crust consisting mainly of igneous and metamorphic rocks. Sedimentary rocks are deposited in layers as strata, forming a structure called bedding, sedimentary rocks are important sources of natural resources like coal, fossil fuels, drinking water or ores. The study of the sequence of rock strata is the main source for an understanding of the Earths history, including palaeogeography, paleoclimatology. The scientific discipline that studies the properties and origin of rocks is called sedimentology. Sedimentology is part of both geology and physical geography and overlaps partly with other disciplines in the Earth sciences, such as pedology, geochemistry, sedimentary rocks have been found on Mars. Clastic sedimentary rocks are composed of rock fragments that were cemented by silicate minerals. Clastic rocks are composed largely of quartz, rock fragments, clay minerals, and mica, any type of mineral may be present, clastic sedimentary rocks, are subdivided according to the dominant particle size. Most geologists use the Udden-Wentworth grain size scale and divide unconsolidated sediment into three fractions, gravel and mud and this tripartite subdivision is mirrored by the broad categories of rudites and lutites, respectively, in older literature. The subdivision of these three categories is based on differences in clast shape and breccias), composition. Conglomerates are dominantly composed of rounded gravel, while breccias are composed of dominantly angular gravel, composition of framework grains The relative abundance of sand-sized framework grains determines the first word in a sandstone name. Red beds are sedimentary rocks, which typically consist of sandstone and shale that are predominantly red in color due to the presence of ferric oxides. Frequently, these sedimentary strata locally contain thin beds of conglomerate, limestone. The ferric oxides, which are responsible for the red color of red beds, classic examples of red beds are the Permian and Triassic strata of the western United States and the Devonian Old Red Sandstone facies of Europe. Van Houten developed the idea to include the in situ reddening of the sediment by the dehydration of brown or drab colored ferric hydroxides and these ferric hydroxides commonly include goethite and so-called amorphous ferric hydroxide or limonite. Much of this material may be the mineral ferrihydrite, thus detrital ferric hydroxides, including goethite and ferrihydrite, will spontaneously transform into red-colored hematite pigment with time. This process not only accounts for the progressive reddening of alluvium, the formation of red beds during burial diagenesis was clearly described by Walker and Walker et al. The key to this mechanism is the alteration of ferromagnesian silicates by oxygenated groundwaters during burial. Walker’s studies show that the hydrolysis of hornblende and other iron-bearing detritus follows Goldich dissolution series and this is controlled by the Gibbs Free Energy of the particular reaction. These include mixed layer clays, potassium feldspar and carbonates as well as the pigmentary ferric oxides, reddening progresses as the diagenetic alteration becomes more advanced and is thus a time dependent mechanism. The other implication is that reddening of this type is not specific to a depositional environment. Secondary red beds are characterized by irregular color zonation, often related to sub-unconformity weathering profiles, the color boundaries may cross-cut lithological contacts and show more intense reddening adjacent to unconformities. Johnson et al. have showed how secondary reddening phases might be superimposed on earlier formed primary red beds in the Carboniferous of the southern North Sea, the general conditions leading to post-diagenetic alteration have been described by Mücke. 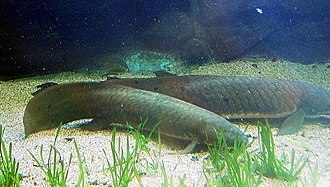 The Queensland lungfish, Neoceratodus forsteri, is a surviving member of the family Neoceratodontidae and order Ceratodontiformes. It is one of six extant lungfish species in the world. Endemic to Australia, the Neoceratodontidae are an ancient family belonging to the class Sarcopterygii, fossil records of this group date back 380 million years, around the time when the higher vertebrate classes were beginning to evolve. It is one of six extant representatives of the ancient air-breathing Dipnoi that flourished during the Devonian period and is the most primitive surviving member of this lineage. The five other freshwater species, four in Africa and one in South America, are very different morphologically from N. forsteri. The Queensland lungfish can live for days out of the water, if it is kept moist. The small settlement of Ceratodus, derives its name from that of the Queensland lungfish, the Queensland lungfish is native only to the Mary and Burnett River systems in south-eastern Queensland. It has been distributed to other, more southerly rivers, including the Brisbane, Albert and Coomera Rivers. The Queensland lungfish has introduced to the Pine and Condamine Rivers. Formerly widespread, at one time at least seven species of lungfish were in Australia and this species lives in slow-flowing rivers and still water that have some aquatic vegetation present on banks. It occurs over mud, sand, or gravel bottoms, the lungfish is tolerant of cold, but prefers waters with temperatures between 15 and 25 °C. The Queensland lungfish is incapable of surviving complete desiccation of its habitat, unlike the African species, Protopterus, it does not survive dry seasons by secreting a mucous cocoon and burying itself in the mud. The Queensland lungfish is essentially a sedentary species, spending its life within a restricted area and its home range rarely extends beyond a single pool or, two adjacent pools. It does not follow a set path, but may actively seek out suitable spawning habitats between July and December. Mudstone, a type of mudrock, is a fine-grained sedimentary rock whose original constituents were clays or muds. Grain size is up to 0.0625 mm with individual grains too small to be distinguished without a microscope, with increased pressure over time, the platey clay minerals may become aligned, with the appearance of fissility or parallel layering. This finely bedded material that splits readily into thin layers is called shale, the lack of fissility or layering in mudstone may be due to either original texture or the disruption of layering by burrowing organisms in the sediment prior to lithification. Mud rocks such as mudstone and shale comprise some 65% of all sedimentary rocks, mudstone looks like hardened clay and, depending upon the circumstances under which it was formed, it may show cracks or fissures, like a sun-baked clay deposit. Mudstone can be separated into categories, Siltstone – more than half of the composition is silt-sized particles. Claystone – more than half of the composition is clay-sized particles, mudstone – hardened mud, a mix of silt and clay sized particles. Kemp-Kell Building, circa 1910, now known as the Holt Hotel, was one of the first five-story office buildings in the city. Cathedral Rock near Sedona, made of Permian redbeds. University Museum Building of the Harvard Museum of Natural History. Skeleton of Eryops megacephalus in the National Museum of Natural History, Washington, D.C.
A range of Calamites specimens, illustrating the different appearance of fossils preserved under different taphonomic modes.